Can dogs see color? For a long time veterinarians believe that they could not. 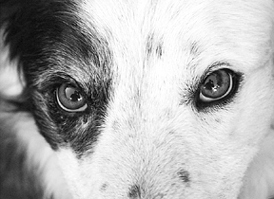 The common misconception that dogs can only see in black and white had persevered for years. However, a recent study carried out by Russian scientists in 2013, finally put an end to the myth. Dogs can see in color, however their vision and color perception is not as acute as us humans. It turns out that dogs do have color vision, but due to the fact their eyes contain only 20% of the cone photoreceptor cells that we have, they interpret color in a lower resolution to us. The various experiments and behavioral tests concluded that dogs see in shades of yellow and blue. 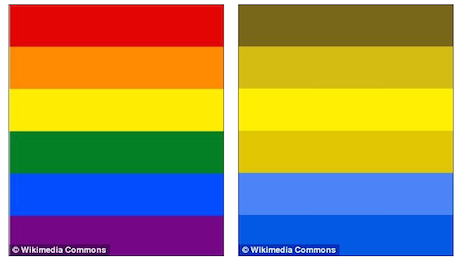 Their eyes are unable to perceive colors in the spectrum range of green to red however. Put simply, the world in the eyes of a dog is represented in hues of yellow, blue and gray. 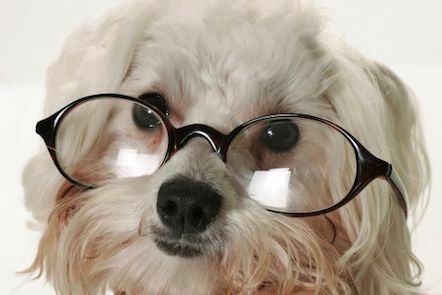 The scientists also discovered that a dog’s visual acuity is not as developed as humans. In laymen’s terms this means that an object in the distance that a human can see clearly, will appear blurred to a dog. Conversely, in lower light, a dog’s vision is more advanced than ours; with canines being able to see more clearly and detect motion better than we can. These traits, alongside a dog’s acute sense of smell, have obviously developed in order to aid the hunt. Our human eyes contain three ‘cones’ that are able to detect red, blue, yellow and green light. This enables us to see right across the full color spectrum. Dogs on the other hand only have two cones. Scientists have discovered that dogs cannot see shades of red and green. They can only see the shades as depicted in the right hand box. It was a team of researchers from the Laboratory of Sensory Processing at the Russian Academy of Sciences, that finally brought an end to the long term questions of whether dog’s saw in black or white or color. As part of their comprehensive experiment, they tested the sight of eight dogs of varying sizes and breeds. The work was a progression of the studies carried out at the University of Washington in 2012. There, scientist Jay Neitz carried out experiments in an attempt to detect the amount of cones dogs had within their eyes. This he believed would lead to a greater understanding of the colors a dog could possibly detect. In the Russian experiment, the scientists printed four different colored pieces of paper. The colors were dark yellow, dark blue, light yellow and light blue. The dark and light hues were used to ascertain whether dogs use brightness levels to distinguish between items. For the first test, the researchers used a dark yellow and light blue sheet of paper, as well as a dark blue and light yellow combination. These colored pieces of paper were placed in front of food bowls located inside locked boxes. The scientists unlocked one of the boxes and placed the dark yellow piece of paper in front of a box containing raw meat in each trial. Each of the tests was designed so that the dog could to try to open one box before being taken away. After only three trials the dogs were able to learn which of the colored pieces of paper was in front of the box containing the meat. Rather conclusive evidence that the dogs were able to differentiate the dark yellow paper from the other colors. However, the scientists also had to determine whether the dogs were picking the box based on the color of the paper or its brightness. To do this they used the dark blue paper in front of one of the boxes, with a light yellow paper being used in front of another. The rationale behind this was simple: if the dogs chose the dark blue color, they were choosing based on brightness rather than color. Without fail, each dog chose the light yellow paper. Conclusive evidence that the dogs could see color, and were choosing the box based on the colored paper placed in front of it. In total, 6 out of the 8 dogs made the color choice between 90 and 100 per cent of the time. So, as you can see, the Russian scientist finally got to the bottom of the age old question – can dogs see in color. The simple fact is, yes they can. However, they cannot see in the color range between red and green. Which is actually quite ironic if you look at the kind of toys available for dogs. The most popular colors are bright reds and oranges and often green. To your poor dog, these are all a greyish, if not blackish hue. So bare that in mind the next time you go shopping for your pet.